The Newman Collection at Saint Mary's College of California comprises over 5,000 items including about 1,200 tracts and 500 volumes of bound periodicals. 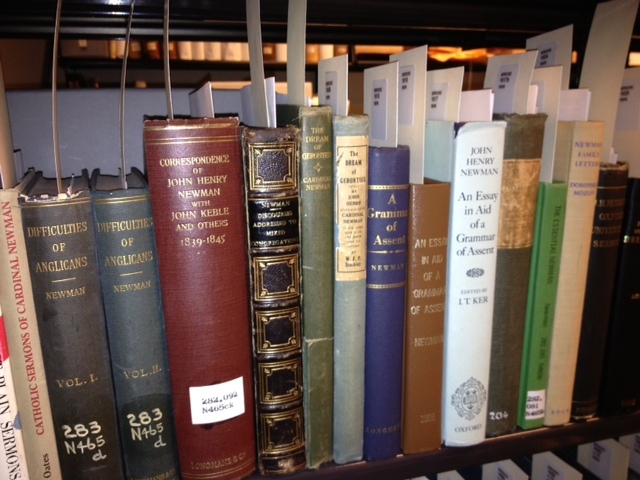 About half of the Collection consists of Newman's own writings, and of books about him. The rest deals with the environment of thought in which he lived and with the history of religion in England and Europe in the nineteenth century. 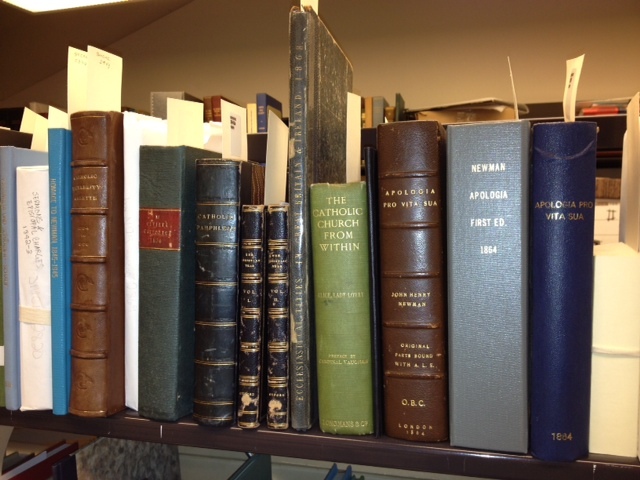 The divisions of the Collection include works concerning eighteenth century British Catholicism, the Catholic Emancipation Act of 1829, the Oxford Movement, the restoration of the Roman Catholic hierarchy in Great Britain, anti-Catholic or "No-Popery" literature, ritualism in the Church of England, Vatican Council I (1869-70), liberal Catholicism, the Old Catholic Church Movement and the Kulturkampf in German-speaking states following the Vatican Council. 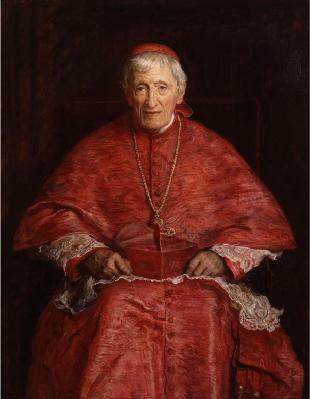 Published biographies and critical reviews of Newman's life and works run to hundreds of titles, in many languages. The collection has a large number of these, including many in English and several in German, French and other languages. Of Newman's complete works, the Saint Mary's collection has nearly all, including many not published in the standard forty volume set. Among the additional works not readily available, the Library has Newman's sermons, both those preached as university sermons and plain sermons; and the original editions of articles published in such rare journals as the Rambler, the British Critic, and the Catholic University Gazette. While the Collection has none of Newman's manuscripts, it does contain numerous rare first editions, pamphlets and private editions of Newman's works. Outstanding among these are exemplars of The Undergraduate, Newman's first published work. With his friend J. W. Bowden, Newman edited and published six issues of The Undergraduate in 1819. Newman's Reports as the first Rector of the Catholic University of Ireland, like all of his writings, are marked by a lucidity and directness rare in an essentially bureaucratic document. His reports of progress in obtaining accreditation of the Medical School, new acquisitions for the Libraries, and improvement in the preparation of students are interspersed with mentions of the need for funding and concerns over the deficiencies of students. Newman was Rector for three years, from 1854 to 1857. The collection has his Reports for all three academic years. Another of the treasures of the Collection is a volume of Latin texts evidently gathered by Newman for his study and bound for him. Included in the small volume is a fifth century text of Saint Vincent of Lerins printed in 1613. At the point in the text where Saint Vincent establishes the Catholic canon ("quod ubique, quod semper, quod ab omnibus creditum est...") is a marginal note "vera!" in Newman's hand (p.18). Newman derived from the Vincentian canon the ideas of faithfulness to tradition and the progress of Catholic doctrine which became the hallmarks of his thought. 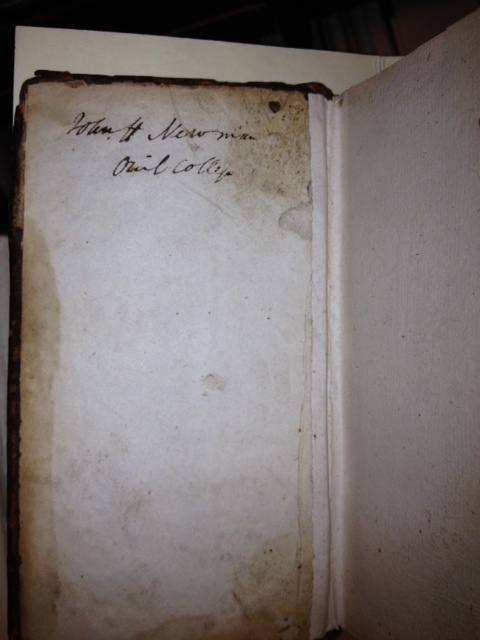 Inscribed on the flyleaf: J. H. Newman, Oriel College. For half of his life, Newman was a member of the established Church of England. As one of the founders and prime movers of the Oxford Movement which sought to revitalize the Anglican Church, Newman worked with Keble, Pusey, Froude and others to refine the liturgy and the intellectual underpinnings of the Church's theology. The Collection contains numerous works concerning the Oxford Movement, including first editions of many sermons and pamphlets. Chief among these is a complete set of the ninety Tracts for the Times writted by Newman and other members of the Movement. According to Newman, John Keble's "National Apostasy" Sermon began the Oxford Movement. The Collection has both the original 1833 edition and a centenary reprint of the sermon. 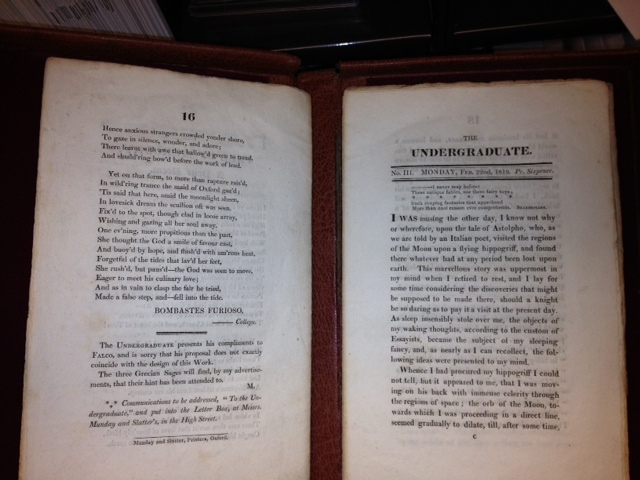 John Keble's collection of poems The Christian Year was published in 1827 and met with immediate popularity. The slim, gilt-edged volumes were carried (and memorized) by Oxford undergraduates hungry for a new sense of devotion. This work, one of the aesthetic precursors of the Oxford Movement, is represented in the Collection by a fine first edition. In nineteenth century Europe, religion and politics were strongly tied. In England, reforms in government gradually admitted Roman Catholics into public life: in the Universities, in government and in other areas. These changes took place against a strong undercurrent of anti-Catholic feeling, manifest in the extensive "No-Popery" literature of the time. The collection contains a large number of these tracts and also key documents concerning the reforms which emancipated Catholics in Britain. Anti-Catholic suspicions were not merely a product of the uneducated. One of Newman's greatest works Apologia Pro Vita Sua, was written in response to a long pamphlet attacking him and the Catholic faith. Newman answered the attack in a set of pamphlets subsequently republished as a book. The Collection contains both a set of the rare pamphlets and a first edition of the book. The deep reflections which led to Newman's conversion to Catholicism are the subject of both the Apologia and the Grammar of Assent, represented in the Collection by an 1870 first edition. Following Vatican Council I in 1870, the Catholic Church in German-speaking countries was troubled both by the splitting off into the Old Catholic Movement of bishops who dissented from some of the council's reforms and by attacks on the Church by Otto von Bismarck, who sought to subjugate religion to the state in the new German Empire. The Collection contains a significant number of documents concerning both the Kulturkampf in Germany and the Old Catholic Movement. Newman scholarship is very much alive today, with books and articles on his thought being written by scholars in a wide range of disciplines. As Father Dessain put it in his introduction to a volume of Newman's letters, Newman raises interst among such diverse groups as "...the students of English literature; the historians, both secular and ecclesiastical; the educationalists, the psychologists , the social scientists, those interested in the theory or the practice of politics; the philosophers and theologians, the men of religion and those concerned for the spiritual life and perfection; the controversialists; and...not least the 'general readers', the ordinary men whose rights and needs Newman had always so much at heart". The cataloging of this collection is an ongoing project and will hopefully be completed in the very near future. It is our hope that this Saint Mary's College Library special collection can be of use to the full range of scholars and students interested in Newman and his times. The Library's Special "Newman and his Times" Collection is part of an international collaborative effort to digitize research materials representing the life and works of John Henry Cardinal Newman. Spearheaded by the National Institute for Newman Studies (NINS) located in Pittsburgh, this project is part of its "Newman Knowledge Kiosk" to serve the research needs of Newman scholars worldwide. The goal of the project, according to NINS website, is to "digitally scan the combined Newman resources of the Kelly Library at The University of St. Michael's College at the University of Toronto, Saint Mary's College, in Moraga California, and St. John's Seminary Library, which is owned and operated by the Archdiocese of Boston. Each institution has developed a world-class Newman collection. Together, these sources will constitute a digital library that will be the finest Newman collection in North America." NINS has provided funding for the scanning and cataloging of the collection, both of which are nearing completion as of 2015. The Library contributed staff time for organizing the project, evaluating, and packing the collection, reviewing the cataloging and quality of scans, importing catalog records and linking to the digital images from Albert. It is a tribute to the work of former brother Thomas Loome and deceased Special Collections Librarian, Andrew Simon, who developed and organized this collection for the use of future scholars. The collection will be more widely used and acknowledged than they could have dreamed. The Undergraduate, (periodical), Numbers 1-6 (No. 1 is a reproduction), dating from Monday 8 February 1819 to Saturday 20 March 1819. An Essay on the Development of Christian Doctrine. London: James Toovey, 1845. Lectures and Essays on University Subjects. London: Longman, Green, Longman, and Roberts, 1859. Discourses on the Scope and Nature of University Education. Dublin: James Duffy, 1852. An Essay in Aid of A Grammar of Assent. New York: Catholic Publication Society, 1870. S. Vincentii Lerinensis. Adversus prophanas omnium haereseon... (pp. 1-102). Ioannes Coster. Commentaria (pp. 103-139). Edmundi Campiani. Theologi oblati certaminisin causa fidei, rationes decem (pp. 139-226). Coloniae (Cologne): Arnoldi Mylij, 1613. John Keble. National Apostasy Considered in a Sermon Preached in St. Mary's, Oxford before His Majesty's Judges of Assize, on Sunday, July 14, 1833. Oxford: J. H. Parker, 1833. John Keble. The Christian Year: Thoughts in Verse for the Sundays and Holydays throughout the Year. Oxford: J. Parker, 1827.